because they had just what I was looking for. They carry a wide selection of stencils, including my favorite ones, their feed sack stencils. I ordered several and was very happy with the quality. I have used the same stencils over and over and over again and they still have years of life in them. Here are a few projects I have made with my stencils from Maison De Stencils. These stencils can be used on furniture, pillows, signs, walls, etc. have done using their stencils~you'll be amazed! The 2 signs above are available in my etsy shop. So, would you like the chance to win your choice of stencils from Maison De Stencils? They are giving away, not one, but 2 stencils to one of my readers! Visit their shop and let me know which stencils you would pick if you won. Be sure to leave your email address, and remember, you do not need a blog to enter any of my giveaways. your choice of any 5 1/2 x 11 1/2 stencil! what a hard decison-I adore this shop and love all of their feedsack stencils, esp. their Lucas Moller stencil! Thanks for the chance! Love the feedsack stencils with the stripes. I've always wondered where you got your stencils. Can't wait to see Cody's room reveal. Thanks for all the inspiration, Melaine. I miss your spot at Ruffles and Rust! Love Love.. I always wondered how you did your stencils. I love anything French.. It reminds me of my time in France with my memere and pepere. I would probably choose one of their french stencils and a number stencil. There are so many wonderful ones to choose from! It would be a hard decision. Thanks for this opportunity! If I won, I would choose the Bee Crown with Laurel Wreath and the C'est Bon stencils! But I love them all!! 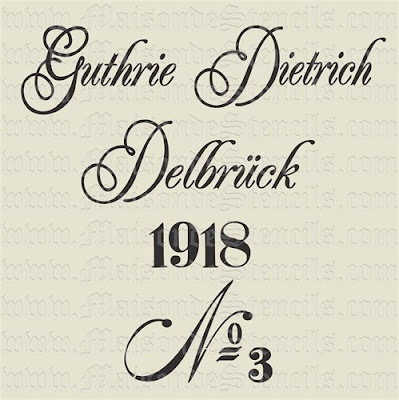 Especially the German Grain Sack stencils!! oh my!!!! such cute stuff. I had a hard time choosing my favorite two. Love all the UK stuff....but I think I'd choose the Cheverny crest with fleur de lis, and the Old world numbers. Great stuff! Thanks for the giveaway! I love the Joyeux Noel with Scroll! Oh, so many to choose from. It's tough to choose but, if I had to pick two, I would choose Initials and Stripes and Lentilles Vertes. both are from the feed sack line. loving the harlequin or diamond background stencil large, and the numbers are to die for! Don't know if I might swing toward the flouish and swirls though! Thanks for the chance to win. I just adore these stencils but if I had to choose I'd say the Laurel wreath 12x12 and the Noel 5.5x11.5. Oh my! So many to choose from! I would choose the Patisserie Label stencil as my friends and family have named my home "The Bakery"! !....or maybe Notting Hill as I loved that movie (and all things British)! For the other stencil I would choose Cottage Kitchen. What a great contest! I am keeping my fingers crossed. Oh my. Definitely Bonne Nuit, Chez Nous, Joyeux Noel or Patisserie. Tough to narrow down a favorite but I love these two Feed Sack Stencils- Paris #13 Rue Saint Honore and LeCoq Rooster in French. i think i like the bon bon reve stencil in the feedsack category the best! What an amazing giveaway :) I adore their stencils, and if I had to choose I'd pick the C'est bon stencil and the feedback with stripes. I love the trellis stencil and any of the number stencils, esp the & stencil! What a wonderful giveaway. I love their stencils! I'm actually ordering my first one this week for a little project I'm doing. If I were to win I would definitely order one of the french stencils and most definitely the number stencil. I love everything french and anything with numbers on it. What an incredible selection! 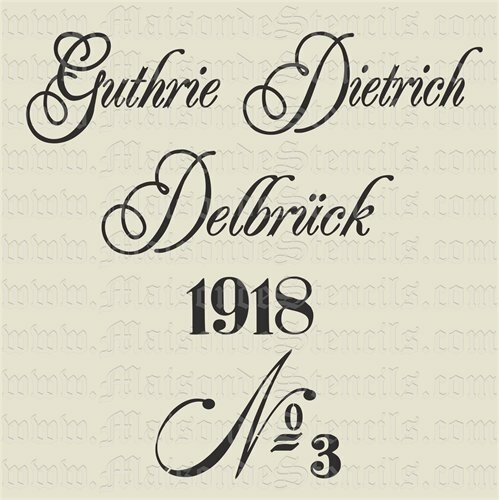 I really like the German Feedsack Replica Stencil. The Le Coq is also perfect. Such great stencils!! I have a bunch of burlap just waiting for the perfect stencil and I think I've found them! Lovin' the feedsack and the number stencils. Oh the things I could create if I only had the stencils! Count me in please! LOVE!!! I especially love the union jack stencil and of course the numbers! I love the number stencil and the bee stencil. You could do so many things with them. Thanks for the giveaway! I really like the bee with crown stencil and the numbers stencils. Oh man, so many to choose from! I love the alphabet one, so much fun! I must admit I love them all, but have a greater love for the damask stencil. Thanks for letting me have the opportunity to enter. I like Chateau No. 7, but then again, I like them all. Thank you for the chance to win these fab stencils! oooh I love these! She has so many great ones. I have to agree, my favorites are the feed sack ones AND the french ones. They are all so perfect! I think their stencils are so beautiful. 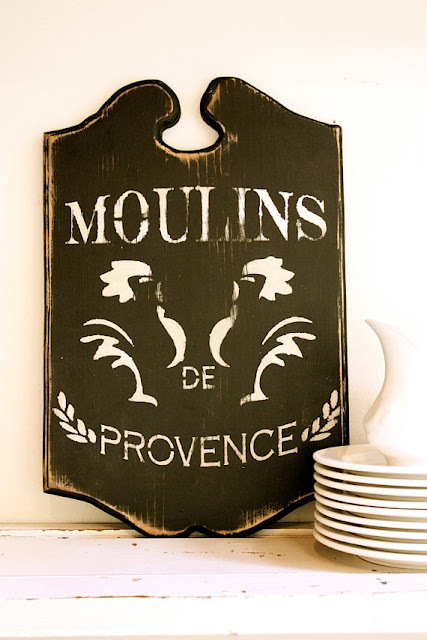 I especially love their grain sack stencils and french stencils. Thanks for having this lovely giveaway. I would love to be entered in your drawing. My contact info is bwrawling at gmail.com. 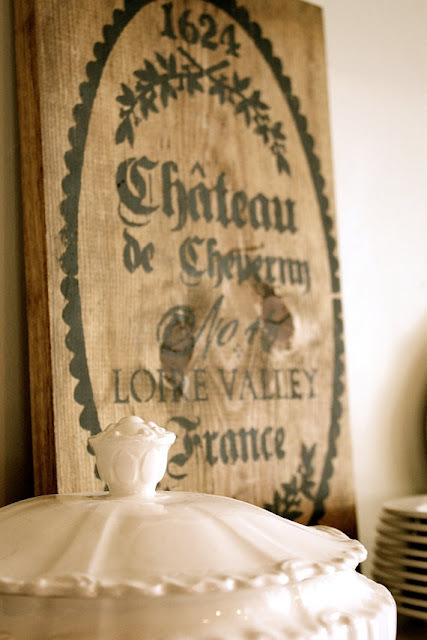 Love those french grain sack stencils!! If I were blessed with winning I think I would choose the Cupids Bed and Breakfast!! I love it and would put it out on the front porch. Beautiful stencils. All of them. I really like the Vespa Girl ones. What awesome stencils! I love the Tres Chic and the Le Bonbon Reve Mon Amour stencils the best. Thank you so much for the chance to win these. I love the "Boulangerie" feed sack stencils and really also love the birds with crowns! Birds with crowns?! How cool! Love their shop. So many good ones to choose from. I like the Old World Number set and the Laurel Wreath with Crown No.7. Thanks!! I really love all the feedsack stencils, I really like your shop! would love any of them so fun!!! love the feed sack stencils!! I love them all! Anything frenchy is great by me! 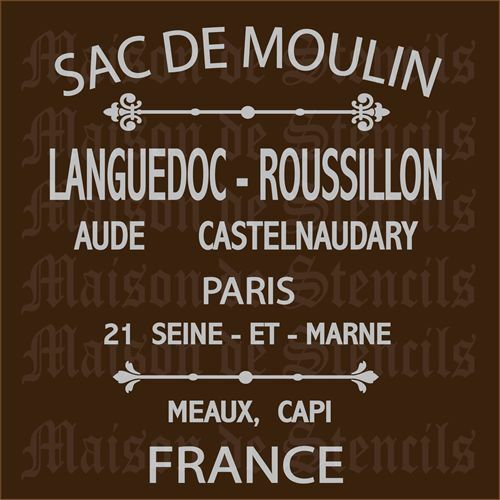 Love these stencils, can't decide on a favorite, anything French, feed/grain sack, large alphabet...oh my goodness, any of them would be fabulous! What a lovely site for stencils! thanks for sharing it and thanks for this opportunity to win! I am thinking I love the clssic fleur de lis... but then again i also love the laurel wreath, maybe with our initials in the center? I have a lazy susan on our oak table that is just so blah- a stencil is what it needs! So hard to choose!! Love them all, but I would probably select one of the chandelier stencils and possibily a grain sack stencil. I would so pick "La Vita e Bella" from the Italian selections. It's a simple reminder of something we are apt to forget from time to time. "Life is Beautiful"---says it all! I would love to win a couple stencils. I have visited their site several times. Having lived in London for a time for my hubbies work and visiting many countries in Europe I would choose either Lucas Moller no 3 with stripe, Lucas Moller German Feedsack, or Notting Hill. I have wanted one (or all:-) of these! I think I would choose Sac de Moulin Stencil or Old World Style Numbers 12 small stencils but I would most likely spend days deciding for sure. They are all so amazing! This would make creating a faux feedsack SO much easier! I like the Boulangerie Label Stencil and Lucas Moller German Feedsack 12 x 12. This is a tough one, they are all so lovely. But I I had to pick two, I'll pick the French Market and the Chateau Marmont. LOVE the number stencils, and the laurel wreaths. So cute! Thanks for the fun! wow! that's quite the amazing selection of stencils! 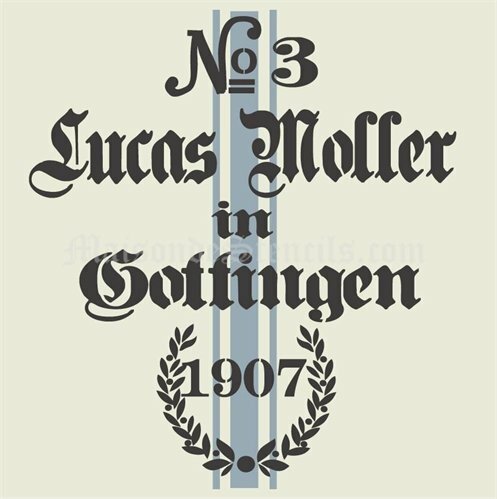 I love the Lucas Moller No.3 but can think of 20 more that I love! What a great giveaway and just in time for me. I need a stencil for my entry way! I love Damask P, it would great for what I am doing. I have a couple of there stencils too and have been very happy with them. I would love to win one! I really like the Boulangerie Label Stencil. I love them all-- but if I had to choose, I'd pick the numbers stencils and the French stencils. So happy to find a new source! How the heck did I miss this post! I would LOVE a Union Jack or a Feedsack stencil. Her stencils are the BEST! These are adorable and so are your signs!! But I am partial to the Italian ones!!! I would LOVE the "Ti amo sei l amore della mia vita - You're the love of my life" sign!! THanks!